1. Once logged in your 123FormBuilder account, go to the Submissions section of your form. 2. Use the drop down on the top right side of the submissions table to select Excel. 3. A lightbox will popup on screen where you may type the email address where the download will be sent to. By default, your email address associated to your 123FormBuilder account will receive the download. You may opt to include or exclude the table header by checking the box. We do not send the excel file in the content of the email, but the link from where you can download it. This is a measure to secure your data. 4. Press Download EXCEL and wait for the email that contains the downloadable link. If you have problems receiving emails from 123FormBuilder, try creating a white list in your email client, as explained in our documentation here. Finally, the email with your excel export should look as in the image below. If you require assistance, don’t hesitate to contact customer support at support@123formbuilder.com. This option to export to an Excel document is available to those who have purchased the program correct? Yes, that is correct. The export as Excel or CSV feature is available on our native paid plans. You must log into your account before exporting the message archive to EXCEL. Make sure you access the EXCEL archive in a browser where you are already logged in. I don’t understand what this is asking me to do? I am logged in to my account and following all the instructions exactly. Please explain? 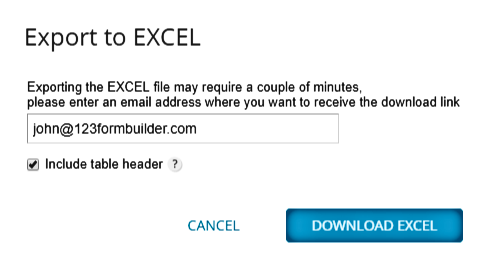 When downloading submissions as an Excel or CSV file, you need to be logged into both your 123FormBuilder account and your email account, in the same browser session. This requirement is an additional security feature. Can I exclude certain columns from the download? I’m not interested in columns like IP address, browser, referrer and so on. When downloading submissions columns cannot be excluded. You can, however, manually delete the respective columns from the spreadsheet. You will be able to select a whole column containing multiple data and after pressing the Delete button, all the information from that column will disappear. If you need further assistance, please do not hesitate to contact our Support team at support@123formbuilder.com, or, via our contact form. I don’t receive the email containing the download link. Why is that? If you are using a custom email address it is possible that the download link ended up in your Spam folder. To make sure you receive all of our emails we recommend that you set up an email whitelist. If you have any other questions, please contact our Support team at support@123formbuilder.com, or, via our contact form. Can I automate form export downloads on an interval basis (say: daily)? Please note that exporting submissions can only be triggered manually. 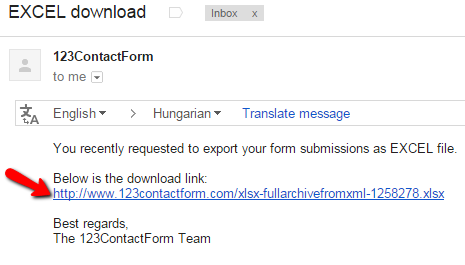 You can, however, integrate Google Drive on your form in order to have submissions directly sent to a spreadsheet. In this case the spreadsheet is automatically updated after each submission. Please make sure to contact our Support Team at support@123formbuilder.com, if you need any further assistance. Can I save the column width in the Submissions table? How to resend multiple submissions at the same time? I cannot download CSV file on Safari. What to do? How to print digital signatures from a single submission? Does 123FormBuilder provide ready-to-go login systems? How to edit form submissions? How can I specify delimiters to use in Excel 2003? Why do I receive the options that were not selected in the multiple choice field?